Vice President Yemi Osinbajo has said that the Federal Government is set to revamp the country’s basic education sector by introducing a new skills-based curriculum focused on coding, animation, graphics design and robotics, among others. 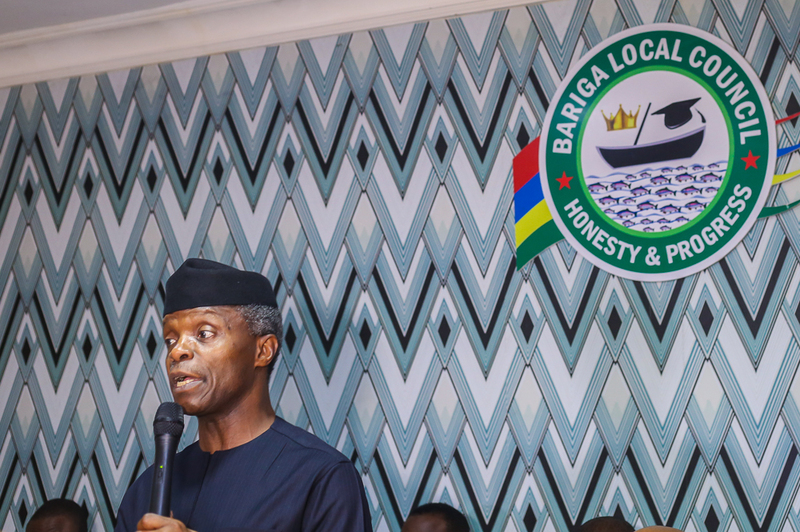 Speaking during the unveiling of the 60th anniversary logo of Grange School in Ikeja, Lagos on Tuesday, Osinbajo said the new curriculum was necessary to lift an estimated 112 million Nigerians out of poverty, achieve all the outcomes specified in the Sustainable Development Goals and produce youths that are ready for the jobs of the 21st century. He said, “The first aspect of the three-fold plan is to ensure that we are able to achieve all the outcomes specified in the Sustainable Development Goals. These include increased school enrolment, improved quality of education, adult literacy and quality of teaching, et cetera. The Vice President added that the school feeding programme had not only helped to improve the learning abilities of pupils, but it had also aided their mental development. “It is known that when one is hungry, one finds it difficult to concentrate. Aside from that, malnutrition is a major problem. It stunts growth and affects the mental development of the child. This is quite heart-breaking. You find that between the ages of zero and five years, if children are not properly fed, they become mentally weaker than those who are properly fed,” he said. Osinbajo also disclosed that the National Economic Council and the Federal Ministry of Education were working on a new curriculum, which would change the way pupils had been educated in the past 10 years. He said, “The third plank of that plan is that we recognise that we are not only grappling with rapid population, but we are also grappling with rapid changes in technology, innovation and the way things are being done. It is obvious that we cannot just continue to educate in the way we used to educate pupils 10 years ago. Besides, to eradicate poverty, our educational system must equip young people to be productive. Stating that the plan would reach 2 million pupils in its first year, the Vice President gave the assurance that the new system of learning would permit the cultivation, expression and adoption of skills that would function in the technology environment. He, however, ruled out the assumption that the curriculum would only be accessible to high-end private primary and secondary schools. Osinbajo said, “The new curriculum is not just for the children in the urban areas, or the few that can afford decent schools higher than the standard of public schools. The policy is ‘Every child counts,’ which means that we have a completely democratised vision of a quality and relevant education to reach every Nigerian child. The policy ensures that all children, including those that are out of school now and in those areas where children tend to drop out of school much faster, get a decent education. On developing the calibre of young people that would take on the challenges of the 21st century, he said there would be a change in the teaching methodology for schools. “To impart the relevant, qualitative and excellent education in our vision, teacher training must be overhauled. In many parts of Nigeria, there are many teachers who do not have the required skills to pass on to the children. So, we are embarking on a massive nationwide teacher training programme, which will ensure that educators are trained in the most current ways and in the most current technology. “As part of the plan, the educational system will also develop skills that are key to nation-building, such as hard work, discipline, cooperation, unity, respect, leadership; the civic skills that are important in building the nation. But the work of changing the story of educational failure in Nigeria is not just the work of government alone, it involves the full cooperation of state governments, religious authorities, in some cases, as well as public-spirited persons and groups. The whole idea is to properly equip and train teachers, properly equip and train educators across the country,” Osibanjo said. What Role Do Teachers Play in Education?